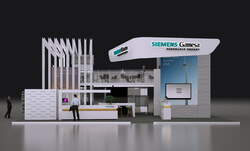 Siemens Gamesa Renewable Energy (SGRE) will attend the Global Wind Summit 2018 in Hamburg between September 25-28, 2018, the industry’s largest exhibition of the year that combines Wind Energy Hamburg exhibition and WindEurope conference. The company will be present with its comprehensive portfolio of products and innovations from the onshore, offshore and service business units at Stand 470 in Hall B6. The 210 square-meter booth will focus on products from digital to analogue solutions and will feature an Xpert-Center with presenters from all the business units. The company will showcase its innovative onshore and offshore portfolio that offers customers best-in-class Levelized Cost of Energy (LCoE). In this sense, the most recent wind turbines for onshore and a market-specific offshore variant by SGRE will mark one of the most important milestones of the event. The company will also feature its broad Service portfolio, including advanced digital services and modular, flexible service solutions, to increase efficiency, lower the cost of energy, and maximize availability and yield. SGRE CEO Markus Tacke will be one of the main speakers at the fair. He will take part in the session “The current outlook for wind in Europe” on September 25 together with top wind industry executives. On September 26, SGRE will host the official Opening Reception at its booth from 18:30 to 20:30. Furthermore, the company will be represented in the conference side of the event by seven other speakers. On time for this international fair, the company will celebrate the roof-topping ceremony of the SGRE Electro Thermal Energy Storage (ETES) prototype located close to Hamburg’s harbor in Altenwerder on September 26. It features a storage capacity of 30 MWh, or enough for 24 hours of energy to supply 1,500 average German households. With digitalization being one of the strategic pillars of Siemens Gamesa and after the success of the first Hackathon in last year’s WindEurope Conference & Exhibition, the company will support the contest Hack the Wind 2018, organized by Wind Europe and InnoEnergy. The challenge sponsored by Siemens Gamesa is about a micro grid in the Hamburg harbor that will be managed by blockchain technology. The microgrid consists of three Siemens Gamesa wind turbines, an industrial customer, and the electric-thermal energy storage (ETES) facility. The objective is to demonstrate the value of such a solution.